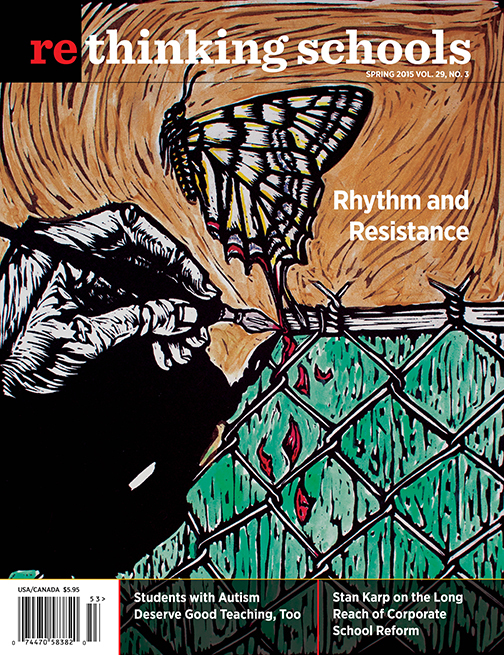 This month, Rethinking Schools publishes Rhythm and Resistance: Teaching Poetry for Social Justice, edited by Linda Christensen and Dyan Watson. Our spring issue features three articles from this new book. At a time when the regime of standardized testing is squeezing poetry and narrative, social studies and the arts out of the curriculum, Rhythm and Resistance presents a vision of teaching and learning with our students’ lives at the center. An early elementary school teacher combines a science lesson and poetry to encourage children to celebrate their own skin tone and that of their classmates. A 5th-grade teacher uses N. Scott Momaday’s brilliant imagery to inspire his students to write metaphoric “I Am” poems. A teaching assistant working with students with autism realizes the behavior modification-based teaching strategies she is told to use are robbing her students of voice and independence. She tries something else instead. Una asistente educativa que trabaja con estudiantes con autismo se da cuenta que la enseñanza para modificar el comportamiento que le piden que utilice les está robando a sus estudiantes su voz e independencia. Así que prueba una alternativa. The Koch-funded Bill of Rights Institute cherry-picks the Constitution, history, and current events to hammer home the lesson that freedom means freedom to make money. A comparison of corporate reform strategies and popular resistance in two very different districts in New Jersey—Newark and Montclair—reveals the flexibility of the privatizers and the potential of solidarity across communities.